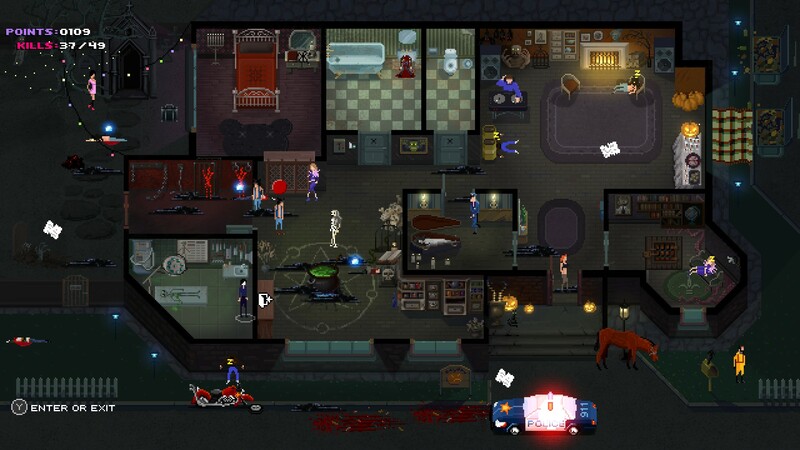 Just kidding, in Party Hard you actually play the “good” bad guy. Well, if you consider quieting down that noisy party that’s been going on next door for hours and it’s 3 in the morning and you want to sleep by killing everyone there…then yes, you are very much the good guy in this game. Enough joking around though. 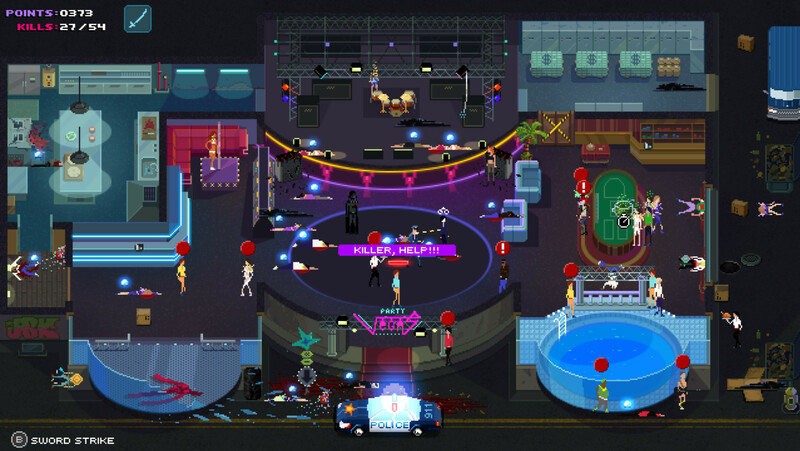 Party Hard is developed by Pinkol and published by TinyBuild Games. It’s an 8-bit game that revolves around the concept that your character needs to kill everyone at these parties that are causing too much noise for you. Using a few skills/abilities, and a knife, you go through the parties and systematically kill everyone without getting busted by the cops. Your arsenal of weapons is basically just a kitchen knife, and then environmental objects. You can rig an electrical panel to shock someone to death if they step in a nearby puddle of water, mess with the stove in the kitchen, set fires if you find a gas can, etc. You have to be careful about the way you go about things because the other party goers will be alerted if you do something near them, and will run to the nearest phone to call the cops. Get them before they call the cops and you’re safe, but generally in my experience if they’re running for the phone your best idea is to hide. If you evade the cops long enough they’ll just get tired and leave. It’s hilarious because one time the cop’s caption was “I’m too old for this…” right when I thought I was busted, and he turned around, got in his cop car and he ran over two people that were standing outside the house! What a nice guy. For those wondering, there is a story revolving around the (aptly named) Party Hard Killings. What starts out as a one-night multi-killing event, spawns into a cross-country party crashing serial killer experience. After each successful level, you get a bit more of the story, piece by piece. There are even additional characters you can unlock as you play through. The only problem with this game for me, is that you really can’t run through it. You have to take your time as you kill off the partygoers, otherwise you’ll run into trouble. Attracting attention to yourself means the cops show up and chase you around, so you need to evade them till they leave, and then go back to killing. It’s a bit more methodical than I thought it was going to be. Not to say that it’s a bad thing, but some levels that have 35+ people you need to take out get frustrating if you make a small mistake or linger in an area too long or try for one extra kill before whisking away into the corners of an empty room or hallway. Overall: The game is fun, some of the environmental deaths are hilarious. Although a bit more patience might be needed to get through some of the tougher level layouts, the pacing doesn’t feel too off. It sort of feels like a single-screen Hotline Miami experience, but it differs greatly in that the only threat to you is when the cops, SWAT, or Mario show up and start chasing you down. The rest of the time it’s mostly you left to your own devices. I find I most enjoy Party Hard when I play a level or two at a time, just to give myself a breather from other games, and as an added bonus it’s got a pretty great soundtrack to go along with it.